The day had not been going well for Indiana Jones. Indy was hard at work at an archaeological dig in Mexico when he was paid an unexpected visit by his old wartime buddy George “Mac” McHale. Then they both were kidnapped by persons unknown, later revealed to be Soviet agents, and brought to an old hangar somewhere in the middle of the United States. Indy was coerced into finding a steel box for the Soviets, and when Indy attempted to escape, he was instead betrayed by Mac, who had decided to side with the Soviets. Nevertheless, Indy managed to escape, but not before riding on a rocket sled and taking a harrowing detour through “Doom Town”. And after a particularly embarrassing decon session, the last thing Indy expected was to be given yet another dressing down by the Feds. This is a simple custom, which involved transplanting an Indiana Jones head over to Mutt Williams. The T-shirt was then painted white, while the pants was painted green to match the US Army pants. A small scar was painted onto Indy’s cheek just below the right eye. When General Ross learnt that his friend Indiana Jones had escaped from Soviet captors and had been taken into custody at a US base, he immediately traveled to the base and vouched for Indy’s innocence. Apparently General Ross had some intelligence about Soviet activity in the United States, since he was carrying a dossier on Colonel Dr. Irina Spalko, which he showed to Indy without reservation. 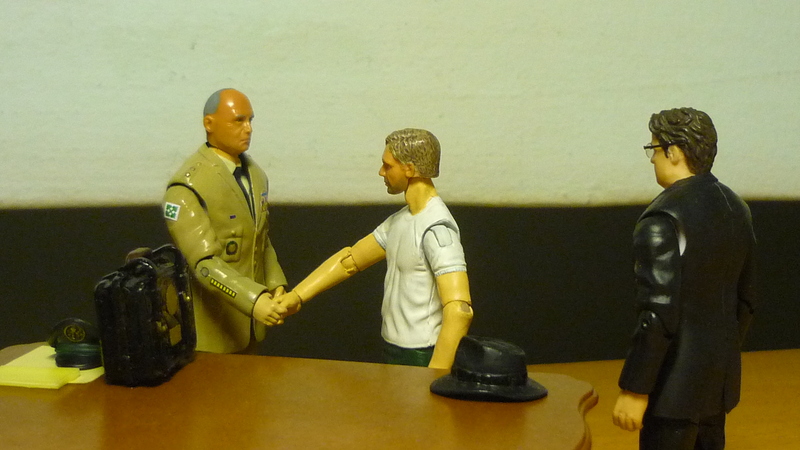 To Agent Smith’s consternation, General Ross then briefed Indy on classified information about Spalko’s mission, and later Ross fended off Agent Smith’s accusation of Indy having communist sympathies. 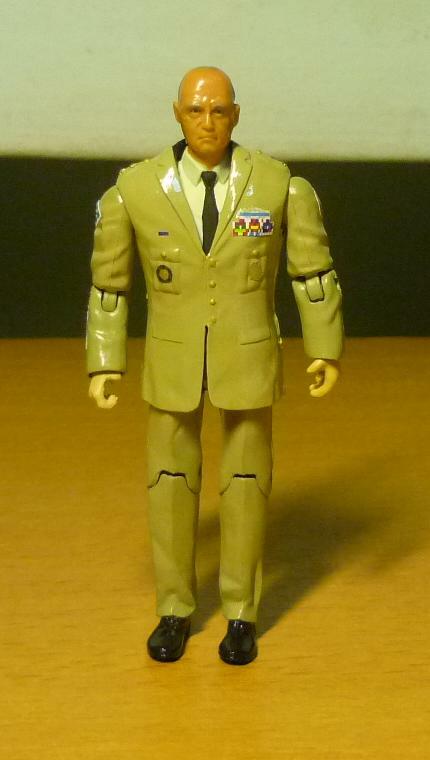 I had acquired a 1:18 General Patton figure some time back as part of my awesome collection. When it came to customizing KOTCS General Ross, I noticed the resemblance between Ross and Patton, and decided that rather than keeping the Patton figure in storage and doing nothing with him, I can put him to good use by doubling him up as a General Ross custom. Epoxy was used to sculpt the buttons, pockets and epaulettes, the suit and pants were painted in buff colour, and the badges and medals were printed out and pasted on. The inner shirt and ties were also painted, which required me to first slit open the suit so that I can do the painting, and then reattach the suit again. General Ross seems to be on a first-name basis with FBI Agent Paul Smith. Here’s some long overdue additions for custom Indiana Jones figures from KOTCS. In 1957, FBI Agents Smith and Taylor were assigned to interrogate Indiana Jones, who was found wandering in the Nevada desert, apparently having survived a nuclear blast. When Indy claimed that the Soviets had at gunpoint forced him to identify a steel box in a top secret military hangar which they later stole, Agent Smith was unimpressed by Indy’s nonchalant attitude and suspected that Indy was possibly in league with the communists, especially since Indy was an old friend of George McHale who had turned to the Soviets. 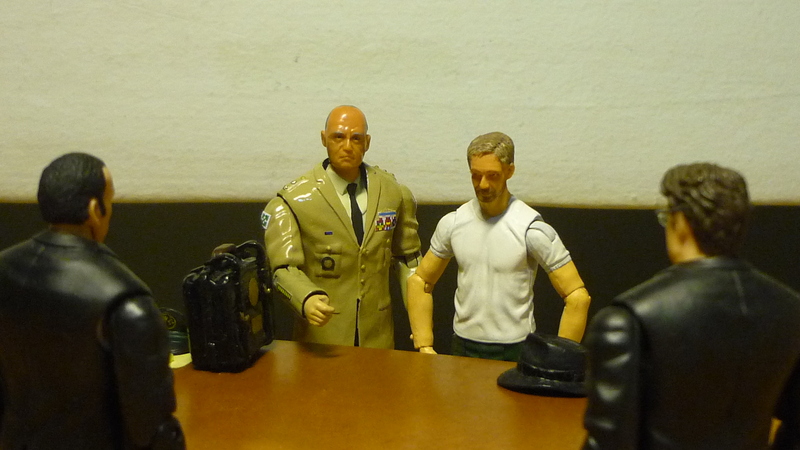 Even as General Ross showed up and vouched for Indy, Agent Smith remained unconvinced of Indy’s innocence, and he grew perplexed when Ross started to reveal classified information to Indy during the interrogation. 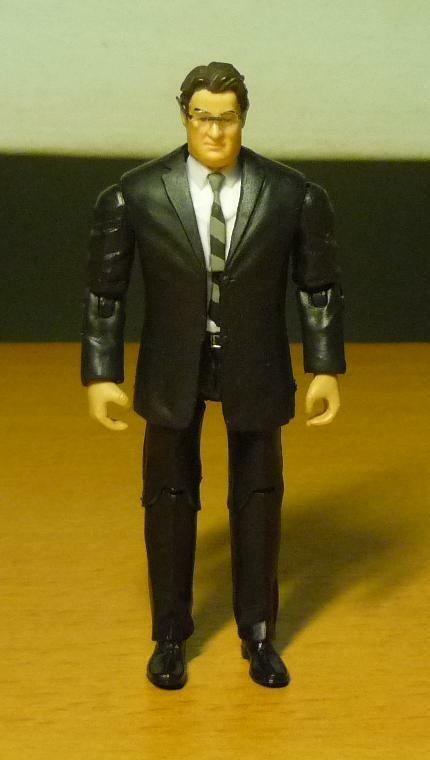 Agent K and Agent J figures from MIB3 are perfect for creating customs of 3.75″ figures in suits, and I was able to acquire a couple of them from a recent clearance sale. 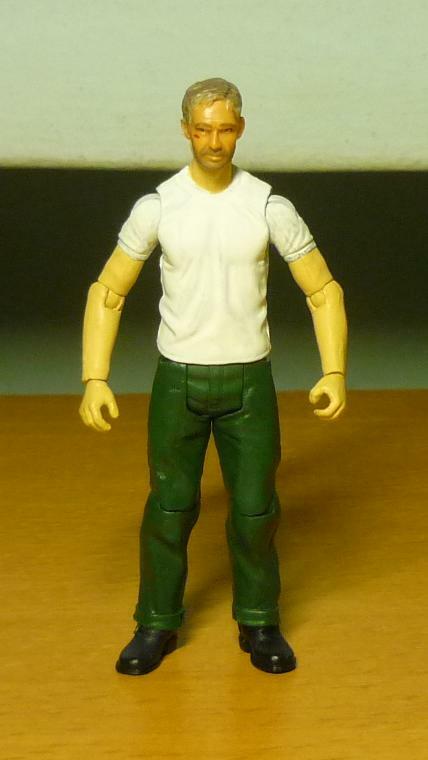 I had earlier acquired the Arnold Royalton figure as possible custom fodder but had not done anything with it. That was until when I started planning for the KOTCS FBI agents, and I found that Royalton’s head somewhat resembled Agent Smith. 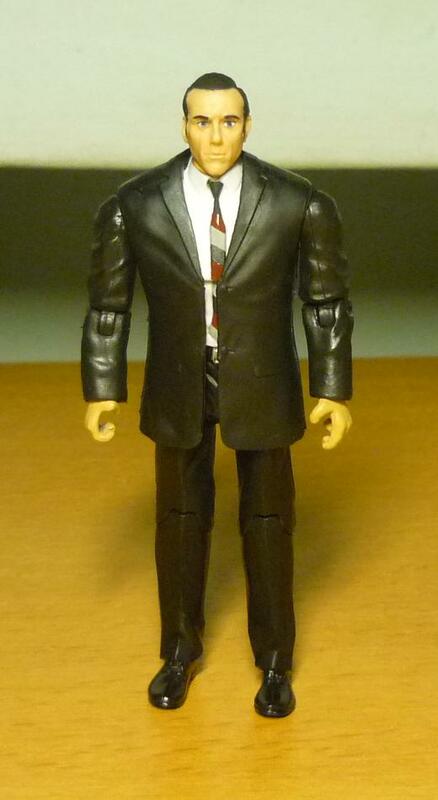 Custom work includes dremeling the head, slicing the jacket to create an open suit, sculpting the lower half of the ties (the MIB3 black suit figures came with only the upper half of their ties), and painting the colour stripes on the tie. The spectacles was fashioned out of clear plastic for the lenses, and plastic strands for the spectacles arms. 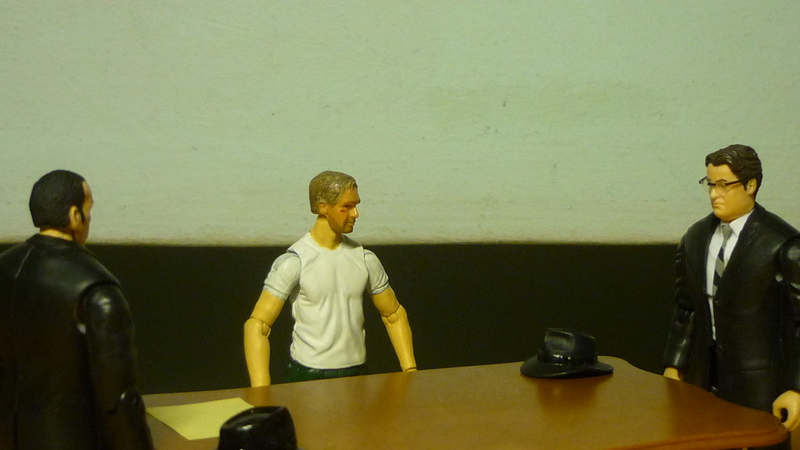 During Indy’s interrogation, Agent Taylor shared in his partner’s suspicions on Indy’s loyalty to his country. Agent Taylor was unswayed by Indy’s war record, and his adversarial tone made Indy wonder which side Taylor fought on during the War. 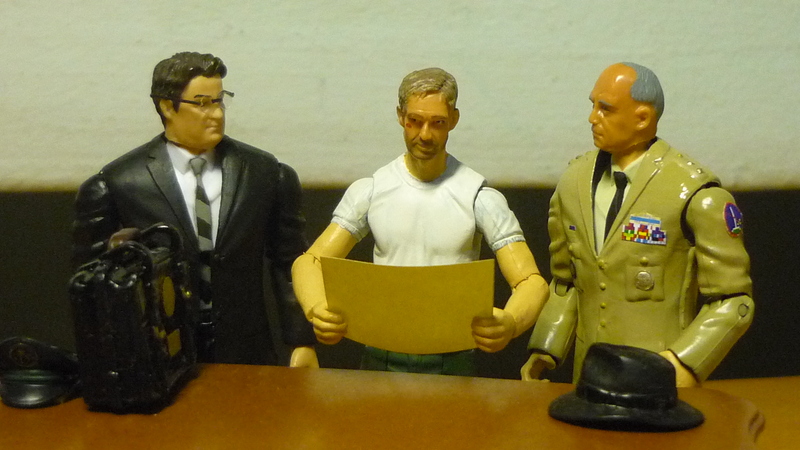 Agent Taylor’s remarks that Indy had seen before the steel box’s contents, allowed Indy to realize that the steel box was somehow connected to a US Air Force recovery project that Indy was coerced into taking part back in 1947. After Agent Smith questioned whether Indy had deserved all the medals he had ever won, Agent Taylor informed Indy that for the duration, he was a man of interest to the FBI. 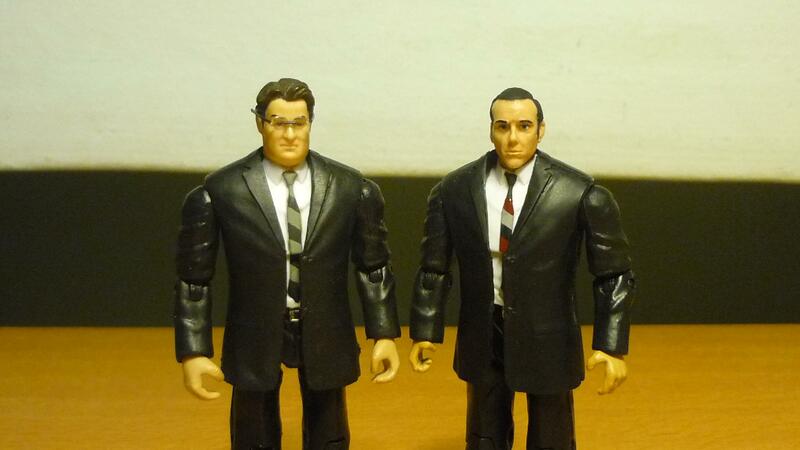 You know, one good thing about using the MIB3 figures to custom make Agents Smith and Taylor is that they all wear the same black suits, so I saved myself the trouble of doing the painting. Well, at least, I only painted the ties, and Taylor’s black hair. Agent Smith and Agent Taylor. In KOTCS, Taylor is actually much shorter than Smith. The Feds give Indy a hard time.